Please, make yourself at home. We are going to talk over a cup of tea – as you like it, accompanied with a piece of cake – here you are! – and discover more about you as a smart human being, a lovely woman, and a strong soul. Well, let me take my papers. I am going to ask you six sets plus a Bonus Qs section of questions covering your personal profile rather than the professional one. Today, you are going to answer the first three sets, then on Thursday the remainder of them. 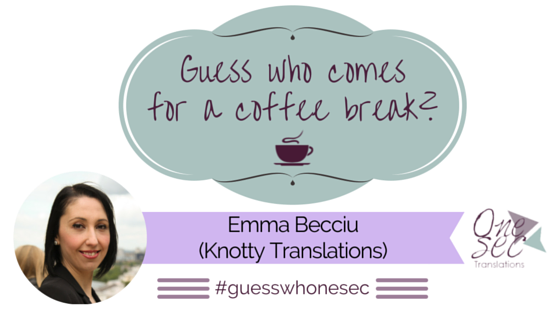 ▷ Emma Becciu, but you can call me Knotty! ▷ I am a freelance translator and interpreter, as you all know, but I also work in a French bakery. ▷ Oh, please, I want everyone to know and to feel free to send me presents! 26/06/1981. ▷ My first ID used very precisely to state “Tall,” but I am 1.73m. ▷ I currently live in London, but I move a lot, although now I feel quite good here. I was born in Sardinia, and I lived there until I was 22, then I started moving around: France, Spain, UK, Australia, and UK again. ▷ I guess we quite agree on this, purple, all shades and nuances. ▷ All the things that usually a girl desires because that’s all she knows. But I started with the idea of being an interpreter when I was 12. ▷ I love animals, but I can barely take care of myself, I am afraid I could not take a good care of a pet. At my dad’s, though, we have an old dog that I love and miss a lot, you all know Gaia I guess. ▷ Tea, milk, no sugar, and boiling hot, I have always been quite British in that. ▷ Sea, river, lake, swimming pool, shower, anything with water, but mainly sea, that is the blessing and the curse of Sardinian people. ▷ Early? What does that mean? I prefer not to sleep rather than waking up early! ▷ At school we learned the flute, but I never learn, my relationship with rhythm is non-existent. ▷ Phone or anything to take pictures and extra batteries. ▷ Anything sweet but honey, with whipped cream and maple syrup on top of the list. ▷ I love cooking if I have guests, but I never cook just for myself, it bores me. My tiramisù is pretty good, and so are my scaloppine, although I am not a big meat-eater. ▷ Heels any time I can, I love how I look in them, although I tend to buy them too high and I end up changing into ballerinas. [ Funny fact >> I put an a/b option for this question. In fact, I intended the letter B precisely for the gentlemen wanting to participate in the series. Well, our knotty-naughty Emma answered that question, as well. ▷ Lazybones in general, but now I am pushing myself to go swimming almost every day. ▷ Like them, and I find Cluedo very interesting and creepy, just my style. I even have a travel version that is extremely cute. ▷ My best friend is a novelist, and her latest book, La sposa di Tutankhamon, is seriously a great book and my favourite along with Dracula. The last one I read, or re-read, is Pride and prejudice just before Bordeaux. I have Alice in wonderland and The great Gatsby abandoned half way and I hope to go back to them soon. ▷ I don’t understand technology, but I love learning about it. ▷ They are all different and all have a favourite side, but I love the challenge that Twitter supposes with its 140 characters. ▷ Not really, but my friends like to see me play because I am horribly clumsy and they laugh a lot. Well, I surely would like to play with you and enjoy your company a little bit more, but, we have just run out of time. Don’t worry, this is your week, so… Hold on, we will be back on Thursday! Follow me and Emma to read why we are used to consider each other doppelgängers! Who’s Emma? ▷ Emma is an Italian translator and interpreter based in London. She always describes herself as half Spanish because she left part of her soul in Salamanca where she graduated. She started blogging as Une belle infidèle in 2012 and created her brand Knotty Translations last December. She has tons of interests that she shamelessly promotes on social media. You can find out more about her on her about.me page that includes all her profiles (Facebook, Twitter, Instagram) and, soon, also on the website that she is creating.